Joe Panik’s solo homers Thursday and Friday put a lot of makeup on the lineup’s blemishes. There was no hiding on Saturday. The bats went silent for a third consecutive game, only this time there wasn’t a big blast to bail the rest of the lineup out. The Dodgers won 5-0 behind Kenta Maeda, who completely overwhelmed a Giants lineup that was supposed to be a strength until the pitching staff can get back to full health. Through three games, the Giants have scored two runs. Giants hitters made Maeda look like Max Scherzer. The veteran right-hander struck out seven in the first three innings and finished with 10, the second-highest total of his career. The first seven hitters in the lineup all struck out at least once and Maeda got Andrew McCutchen twice. 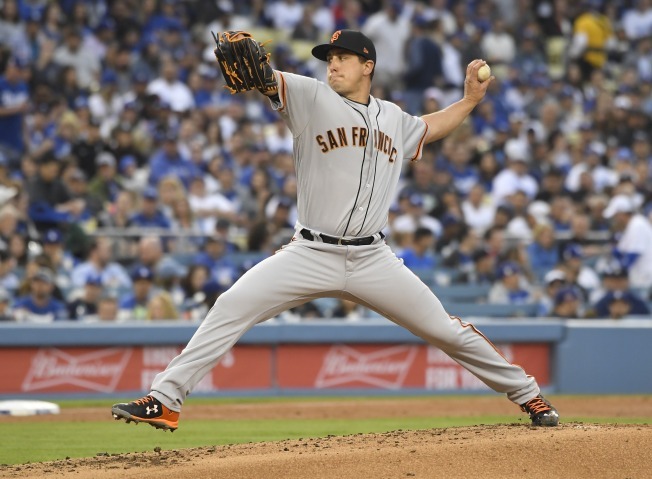 Holland flashed a good slider but also gave up plenty of hard-hit balls in his Giants debut. He was charged with five runs — three earned — in five innings, walking three and striking out four. He certainly wasn’t helped by the guys behind him. It was a sloppy night defensively, particularly in the fourth inning. When Cody Bellinger strayed too far off first, Buster Posey tried to pick him off. Brandon Belt couldn’t handle the throw and Bellinger took second. Two batters later, Gregor Blanco dropped a two-out fly ball to right center, costing the Giants a pair of runs. It didn’t help that McCutchen ran past him at the last second. Evan Longoria also made an error. Longoria was hitless in three at-bats and he’s 0-for-11 in his first three games with the Giants with four strikeouts. He was removed after flying out in the top of the sixth, with Pablo Sandoval taking over at third. Pierce Johnson had a solid debut, throwing a perfect sixth. He’s a guy to keep an eye on going forward. All he has done, from spring training to the Bay Bridge Series to this opening series, is get outs.